If you are looking to purchase a prayer plaque, you can now see what's available at our website, www.or-el.co.il/len/. We have such a special selection for you to choose from. This is important if you want to decorate your local synagogue with the right prayer plaque that is required. There are several different types of prayer plaques which you may select. Our team at Or-El is highly flexible, and it may be more advantageous for you to get in touch with us via email or phone. You may also want to take a detailed look at our website and see who we are and the prayer plaques that we have on offer. You might want to purchase one or more prayer plaques from us, depending on which event or synagogue you are purchasing for. In a scenario where you are looking for a large synagogue, it may be the case that you'll have to obtain several prayer plaques that are the same or different. In the last few years there has been an increasing appearance of prayer plaques in public ceremonies and other interesting events. You may want to buy one of our prayer plaques for this reason, so you will want to look more into what we have available. We at Or-El really do have so much for you to pick from. It is not only prayer plaques that have caught the eye of many buyers these days. Once you are familiar with the products that we have on offer, you will become an expert in decorative designs for synagogues and distinctive events. Our team at Or-El is proud that the prayer plaques we sell provide the safest LED lighting out there! We provide this great feature with our other top products too. The LED lighting which we provide with all prayer plaques consumes less power, and provides higher-intensity and better distributed lighting and heat, plus, it's life expectancy is higher. The technology we use also aligns with standards that have come into effect within EU countries. 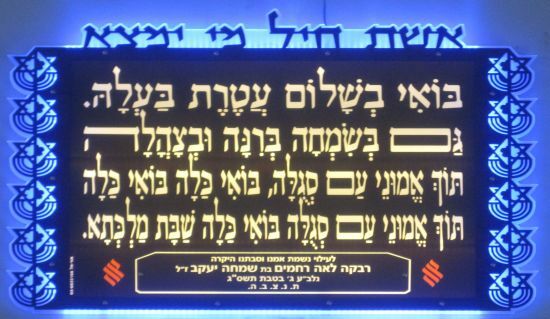 Therefore, decorate your synagogue with beautiful prayer plaques, while we at Or-El provide special LED durability!